Kooper is Mario's second party member in Paper Mario. He is a blue, bold, adventure-loving (and seemingly young) Koopa who dreams of becoming an archaeologist like his childhood hero Kolorado. He is the exact opposite of his successor, Koops, in terms of his personality. However, in the battlefield, the two have very similar abilities. Kooper's name is a pun on "Cooper", but with a K for Koopa. An illustration showing Kooper's overworld ability. Here, he is activating a red ! Switch. Mario and Goombario enter Koopa Village to find that Fuzzies have attacked the village and are stealing all the Koopas' shells. Mario gets the shells back for the Koopas and eventually finds Kooper. He tells Mario that his blue shell had been stolen by a Fuzzy and Mario agrees to get it back. Once Mario gets the shell back for Kooper, he joins the party. In the field, Kooper will retreat into his shell and Mario can shoot him out short distances, allowing him to flip switches, grab items and attack enemies. Kooper has a defense value of 1, meaning he takes one less damage from attacks that happen to damage partners. Kooper receives three letters in the Post Office at Toad Town throughout the game: one from Kolorado's wife, one from Koover and one from his fan. When the game ends, Kooper is seen in an expedition with Kolorado in Shiver City. Kooper is told by Parakarry that Peach wants him at the party (which is held at the end of the game). Kooper wants to help Kolorado instead, but Kolorado insists he goes to the party, and so he does. This adventure-loving Koopa wants to be an archaeologist. He admires Kolorado, a world- renowned expert in archaeology. Press to toss a shell and reach items at a short distance. His specialty is attacking enemies on the ground. Although Kooper himself doesn't appear in Paper Mario: The Thousand-Year Door, early concept artwork exists and unused sprites are found in the game's data. Koops functions very similarly to him, and is even encountered in the first chapter of the game. Although Kooper doesn't appear in Super Paper Mario, his sprites are still present in the game's data. Kooper also appears as a Catch Card found on the thirtieth floor of the Flopside Pit of 100 Trials and as a picture in the Mario Bros.' House. In Super Smash Bros. Brawl he is a Sticker that raises arm attack power of a player by ten. Kooper, along with Goombario are seen with Mario in the Paper Mario arc in Super Mario-Kun. In volume 28's Super Wario-Kun, he is pushed away along with Mario and Goombario by Wario's foot. Card Description: This is Mario's good buddy Kooper from Paper Mario. His Power Shell move was, and is, a thing of beauty. Concept artwork for Paper Mario. Kooper is excited to see Kolorado. Kooper with Kolorado after Mario defeats Bowser. Kameki "Kame" (亀) means "turtle" in Japanese. Kǎmǐguī Based on the Japanese name. 龟 (guī) means "turtle". This name is also the Pokémon Wartortle's official Chinese name. Kooper's unused images, from Paper Mario: The Thousand-Year Door and Super Paper Mario respectively. 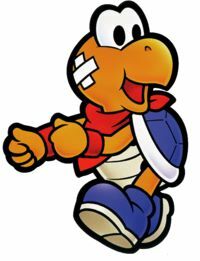 Although one of Kooper's artworks depicts him having an "X"-shaped arrangement of bandages on his cheek, no in-game sprites has shown him as such, not even those of Paper Mario: The Thousand-Year Door or Super Paper Mario. It is worth noting that in another artwork for the game, Mario has a similar arrangement of bandages on his nose, meaning the two artworks may be intended to depict the two after a battle, and not be truly indicative of Kooper's intended appearance. Kooper is one of only two partners in the original Paper Mario to be able to do a First Strike, the other being Bombette. This page was last edited on March 7, 2019, at 19:33.